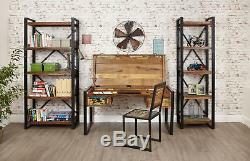 Urban Chic Furniture Reclaimed Wood Home Office Desk Dressing Table Steel Frame. 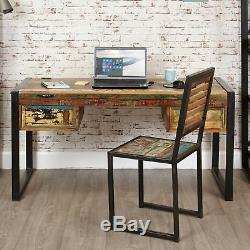 URBAN CHIC FURNITURE RECLAIMED WOOD LAPTOP DESK / DRESSING TABLE STEEL FRAME. 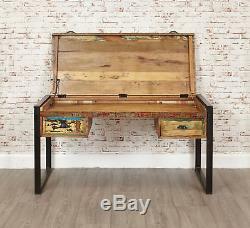 Unique contemporary laptop desk / dressing table. The exclusive Urban Chic range is made using reclaimed wood salvaged from places such as Gujarat, Maharashtra and Rajasthan Southern India. Some of the wood used can range between 50 and 150 years old and is assembled by skilled craftsmen who create this colourful and interesting furniture. As each piece in the range is hand finished using a unique blend of reclaimed timbers, every item is truly individual. A beautifully made steel outer frame gives a fantastic urban edge and offers great structural rigidity. The overall dimensions of the desk are H74 x W150 x D65.5 cm. This desk has two drawers providing useful storage. This desk has a lift up lid providing hidden storage space for your laptop the internal dimensions are H5 x W137 x D63cm. This desk has a metal bracket to hold the top firmly in place. The internal dimensions of the two drawers are H13.5 x W32 x D33 cm. This item requires some minor assembly - all necessary tools, instructions and parts are included. In character solid iron handles complement this piece beautifully. The wood is finished with a resilient satin lacquer which is hardwearing yet emphasises the beautiful colour and character in the timber. Environmentally friendly - much of the timber on this item is reclaimed. Exceptional build quality - designed to last a lifetime. Part of our exciting and exclusive Urban Chic furniture range. Reclaimed Wood, Solid Steel Framing - Urban Style, Each Piece is Unique - Hand Crafted, Contemporary Design, Fully Assembled. H 74, W 150, D 65.5 cm. Solid Wood - Mixture of Reclaimed Woods. This is hand crafted, and as a consequence, all sizes are offered as a guide only. Due to differing screen resolutions, natural variations from batch to batch, it is virtually impossible to accurately portray the true colour of reclaimed wood products - also all products of this nature will look slightly different to the image in terms of the colour finish due to each piece being unique. We endeavour to give the best portrayal of colour but we cannot accept colour or shade differences as evidence of defects. As a general rule, dark items look lighter in reality and light items look darker. ALL deliveries are carried out by a uniformed 1 man service to the front door only, the drivers are not insured to deliver into a room of choice. We obtain a time stamped signature plus any other relevant information (like photographs if any anomaly occurs). All our deliveries are FREE to MOST PARTS OF England. LD, LL, SY, SA, PL, TQ, TR, EH, DG, FK, G, KA 1-26, 29, 30, KY, ML, PA 1-19, TD. Alternatively you can send the goods back at your cost, this has to be in pristine unused condition and sent via a trackable service. Hidden Storage, No Assembly Required, With Drawers. We aim to provide you with the best quality products at the best price with a 100% satisfaction guarantee. If you decide to change your mind about your order and want to cancel it please try to notify us before the item is despatched (exclusions apply on made to order products). But if for any other reason apart from damages / faults you decide the product is not for you then please notify us within 7 days of receipt and we can arrange your return (this does not affect your statutory rights). For damaged / faulty orders this charge does not apply and will be collected free of charge. We reserve all rights on our decision to replace either damaged / faulty parts or a complete unit once we have completed our investigations all will be done free of charge. Our carriers are not insured to carry such large items so we do advise to keep hold of the original packaging before commencing with assembly. Made to order Ready assembled. Failure to do this will result in all responsibility belonging to the customer. The wrong item has been delivered. If it's our fault and you have received the wrong item(s) we will arrange collection free of charge and make the necessary arrangements for the correct item to be delivered as a priority. The office is closed over the weekend and bank holidays. And the most important bit of informationdelivery is FREE! All our deliveries are UK mainland only (will confirm on item page if we cover elsewhere) from Monday to Friday between 8am and 8pm. Before ordering anything please measure the floor space where the item will be housed. Please also measure your door space so the item can fit through (especially for assembled furniture). We will confirm your order within 24 hours and all details will be passed over to our suppliers. In most cases you will be provided with a tracking no so you can track the process of your order. All assembled furniture will come with handles fixed on the inside to prevent damage to item(s) and property. Wardrobes larger than 2 doors will be split into sections so they can be easily taken through your property without damaging anything. These will be bolted together once in the room of choice and handles fixed on the outside. We absolutely value customer feedback and want to make sure everything from selecting your product, to paying, all the way down to using your product that you are 100% satisfied. 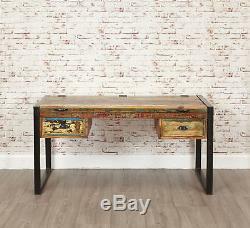 The item "Urban Chic Reclaimed Wood Computer Desk Dressing Table 2 Drawers Steel Frame" is in sale since Monday, May 21, 2018. 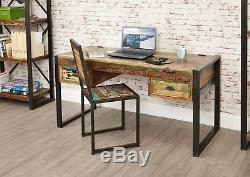 This item is in the category "Home, Furniture & DIY\Furniture\Desks & Computer Furniture".